While the Raspberry Pi Foundation is the main face of the Raspberry Pi board, it only mainly promotes children’s education, and a subsidiary called Raspberry Pi Trading, funded in 2013, handles design, manufacturing and distribution of the Raspberry Pi boards, and puts profits back into the charity. Raspberry Pi Trading has now partnered with Element14 to offer customization services for the Raspberry Pi board. That means you’ll be able to remove or add interfaces and headers, replace the micro SD by a more reliable eMMC flash, add new functionalities to the board, and even re-design the layout in order to better match your project’s requirements. The companies “expect order quantities to start in the region of between 3,000 and 5,000 depending upon the nature of the customization”, so the service does not seem to be available , or cost effective, for smaller orders for a few hundred units. Element14 has access to over 200 engineers via companies such as Embest and AVID technology in order to provide these customization services. You can find more on Element14’s CustomPi page. That’s okay. If it works for what I want to do and it’s manages to be roughly the same wholesale cost of the Pi, I’m interested. It’s a change of attitude in the Industry that’s a positive one. If the Raspi Foundation would make the hardware Open Source, others could take care of this. Raspi couldn’t exist without Open Source Software (their main OS), but they keep their own design closed. Disappointing. If somebody does it on his own, and leverages Raspberry Pi ‘s images, they’d probably block the sale of the Broadcom processors to that project anyway. Just look to what happened with Hardkernel’s ODROID-W. 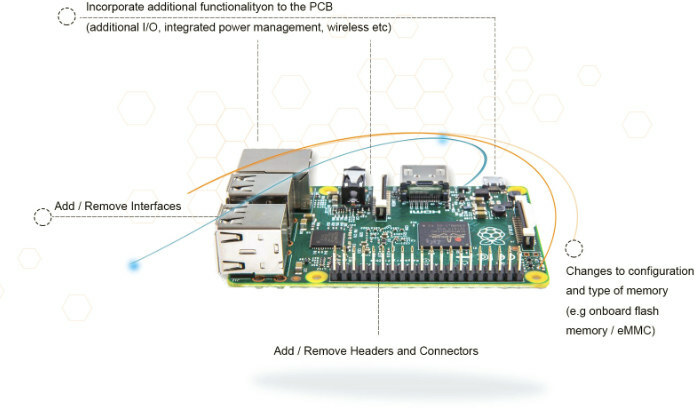 They should offer a custom Raspberry Pi Compute Module. There is still no Compute Module based on Raspberry Pi 2.